Fullmetal Alchemist TV series 鋼の練金術師 DVD is available in the Brazilian market in October 09. Are three ‘discos” with 4 episodes each. The Brazilian DVD presents Portuguese and English subtitles. According Focus Films, audio also is Portuguese and Japanese. Japanese audio has 2.0 and 5.1 format, that is an exclusive version for Brazil. 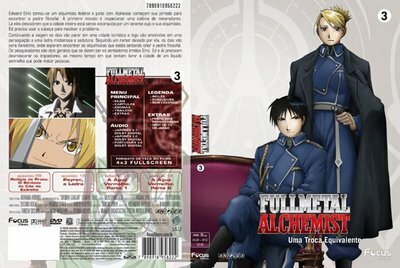 Fullmetal Alchemist TV series 鋼の練金術師 DVD already is available in the Submarino, main Brazilian site of purchases. Oi Sandruxa! C sumiu... Naum gosta mais de mim? leojbox@hotmail.com!